Pinto beans in a cast iron dutch oven are probably the first thing that comes to mind when people think about recipes for their dutch oven. Pictures of a pile of plain pinto beans and a juicy steak at the chuck-wagon on a cattle drive probably comes to mind. For good reason. 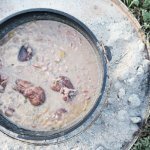 A good supply of dried pinto beans coupled with a sturdy cast-iron dutch oven were perfect for surviving out in the wilderness, far from civilization, for weeks or months at a time. You could also feed a large crew for just a couple of dollars and little effort. Chuck wagon on a Texas Roundup. Some time around 1900. Photographer William Henry Jackson. 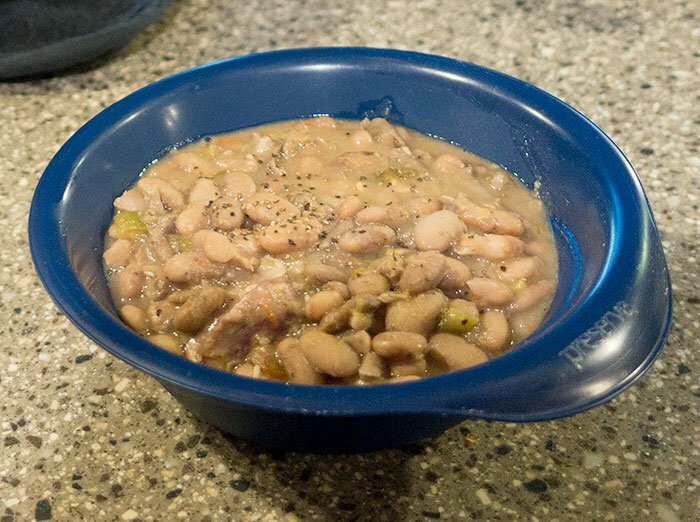 This pinto beans recipe is probably a lot more similar to traditional chuck-wagon fare than some of the “cowboy” bean recipes you’ll find in a lot of other places. 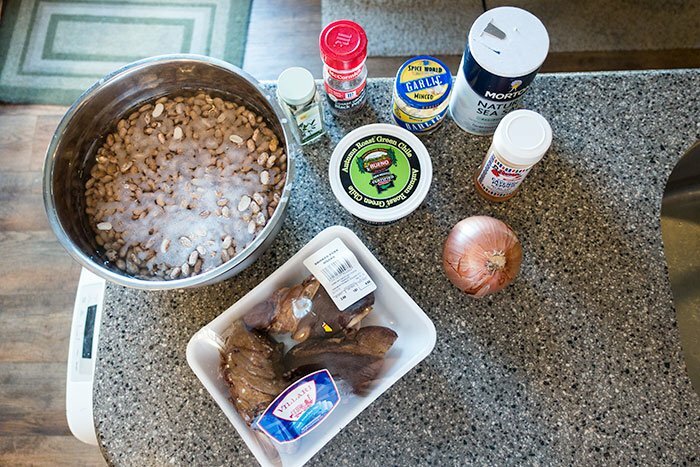 The main reason being that this recipe is for simple, savory, pinto beans rather than the sugary, syrupy stuff a lot of people think of when they think of pinto beans. 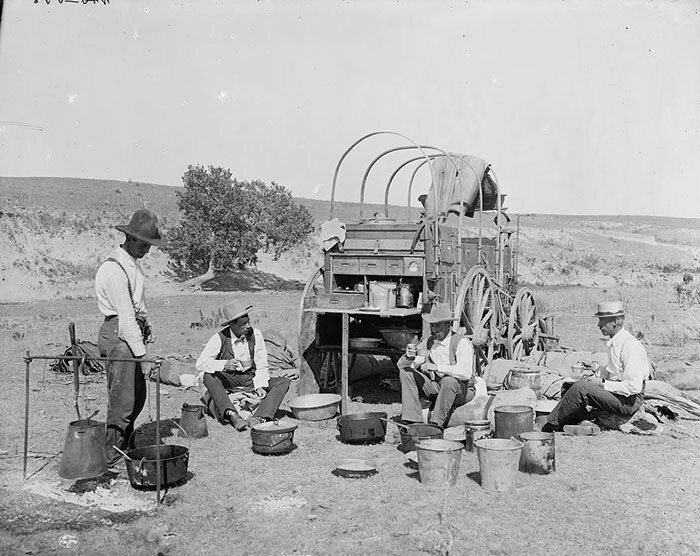 If there was sugar on the chuck-wagon, it was probably reserved for coffee in the morning rather than thrown in with the beans. 1/2 cup diced green chilies – Optional. First, sort through your pinto beans and pick out any rocks or debris. Rinse them in your sink, then toss them in a bowl to soak overnight. If you’re using a Tupperware container to soak your beans in on your trip to the campsite, be certain that its large enough. The beans will swell to about twice their size. You don’t want the lid to pop off mid-trip and end up with beans in your car’s floorboard. Toss your black pepper, cayenne, and bay leaf into a resealable bag. Lastly, dice your onion and toss into a separate resealable bag. 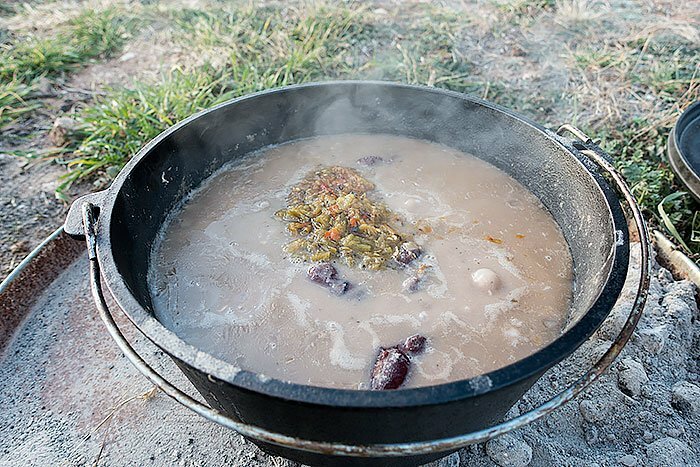 If you can’t do an overnight soak for some reason, you can do a quick soak by throwing your pinto beans into your dutch oven at the campsite, bringing it to a good boil for about two minutes, then taking it off the fire. Let it sit for about an hour, then pour out the water and they should be ready to go. Just don’t forget to sort the rocks and debris out before you do your quick soak. 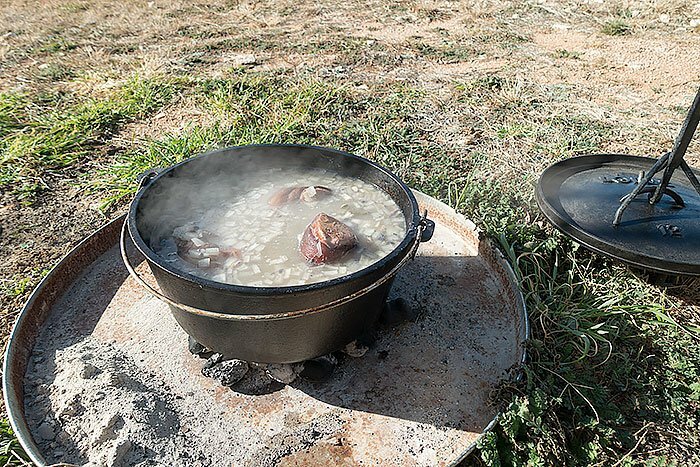 Once you’re ready to get cooking, set up your dutch oven to boil. About 18 charcoal briquettes underneath. 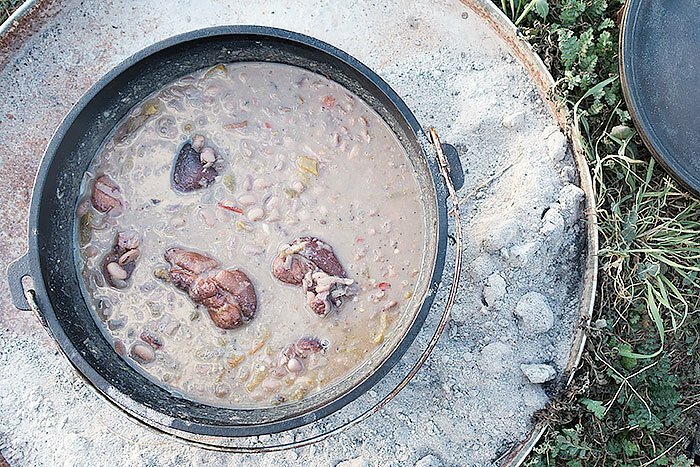 Throw your pinto beans, onion, pork hocks, black and cayenne pepper, garlic, and bay leaf into your dutch oven (the only thing that isn’t going in yet are your green chilies, if you’re adding them). Add enough water to cover all of your ingredients by at least an inch. Don’t worry about being exact here. You can always boil the water down or add more while you’re cooking. Its better if you add too much water to your beans at the beginning than too little. If you have to add water to your dutch oven while you’re cooking, it’ll bring the temperature down and make it take longer to finish. Once all your ingredients have been added (again, excluding your green chilies), then put the lid on it and let it cook. 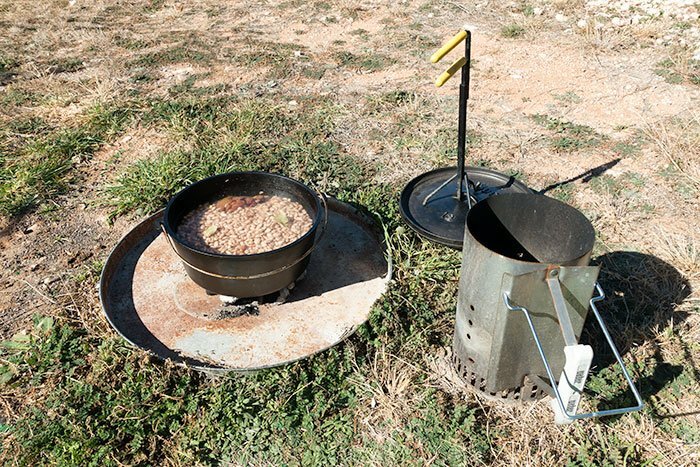 Bring your pinto beans to a boil, then lower your temperature by leaving only about six to eight briquettes under your dutch oven. 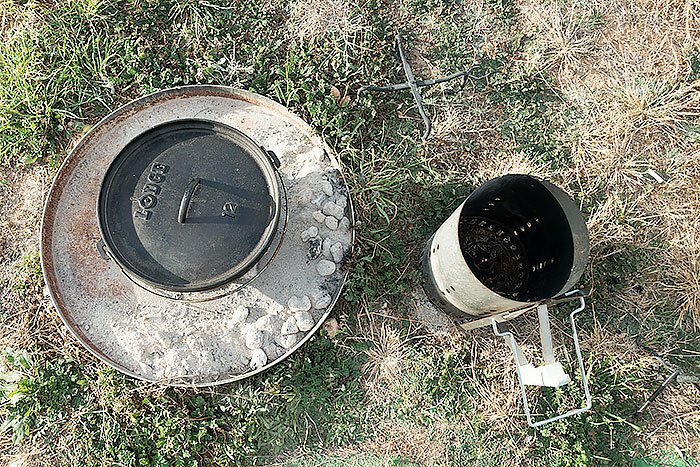 You’ll probably need to add new coals underneath every fifteen to twenty minutes to keep things bubbling. This is a good time to take the lid off and check your water levels and give it a good stir. After about two hours, test your beans by sampling a couple to see if they’re about done. Once they start to get close to being done, toss in your green chilies. If you throw your green chilies in at the beginning, they’ll virtually dissolve by the time your beans are ready. Don’t forget that as your beans start to get close to being done, stop adding any more water. You want the bean juice to thicken up some before serving. If you’ve got too much water in there, just cook with the lid off for a bit to help the water evaporate. Just before taking your beans off the fire, taste again to see if they need any extra salt. Most likely they won’t since you’ve got cured meat in there. Remember, if you over-salt, they’re gonna be inedible, if you under-salt, all you’ll need to do is break out the salt shaker. Sort and rinse pinto beans. Dice onions and toss into resealable bag. Put black pepper, cayenne, and bay leaf in separate resealable bag. Toss all ingredients except green chilies into your dutch oven. Add water to at least an inch above your ingredients. Simmer for about two hours, stirring occasionally and replenishing coals when necessary. When beans are almost ready, add green chilies. Be sure that your water is boiling down so the bean juice is thickening up. If you have excess water, cook with the lid off until it evaporates down. Once about ready to take off your coals, test to see if it needs additional salt. Add salt as necessary, stir, then serve.